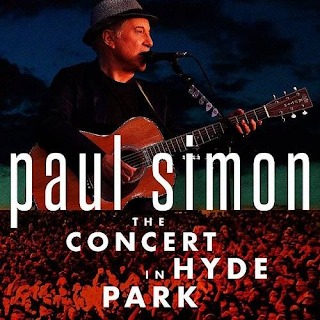 This is an excellent full concert live album from Paul Simon, from London's Hyde Park in summer 2012. There is a vibrant crowd atmosphere and Simon runs through a lot of his back catalogue in the first half of the concert - "Kodachrome"; "50 Ways To Leave Your Lover"; "Slip Slidin' Away"; "Me And Julio Down At The Schoolyard" plus some comparative rarities in "Dazzling Blue" and a rousing "Gone At Last". Reggae legend Jimmy Cliff joins him for a cover of Cliff's "Vietnam" and Simon's "Mother And Child Reunion". There is also a pulsating, drum-powered "The Obvious Child". The second half of the concert is devoted to pretty much most of the "Graceland" album and brilliantly played it is too by the usual assorted South African musicians of the highest quality. It is a joy from beginning to end. He ends with "The Sound Of Silence", "Late In The Evening" and "Still Crazy After All These Years", but in between he makes a bit of a mess of "The Boxer" if I'm perfectly honest. Never mind, it is still a highly enjoyable album and highly recommended. The sound quality is excellent too.